Blue Jays are large, bold songbirds that live across much of North America. They are common throughout their range, which includes the eastern two-thirds of the continent. Here are some facts about this familiar and widespread species. There are at least four subspecies of Blue Jay accepted by most authorities. The Florida Blue Jay weighs an average of just 74 grams, while Northern Blue Jays weigh in at 92 grams or more. Plumage differences between the subspecies are subtle, with some birds showing brighter plumage than others. The other two subspecies are the Coastal Blue Jay and the Interior Blue Jay. Blue Jays are omnivorous. 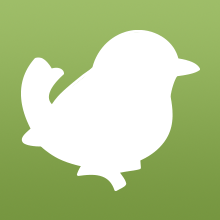 They feed on a wide variety of food items, including large insects, acorns, bird seed, frogs, carrion, eggs from other birds, berries, and more. They love peanuts! Blue Jays are in the Corvid family, a group of birds that includes crows and ravens and is known for intelligence and curiosity. Blue Jays are generally year-round residents throughout most of their range. Birds may move seasonally depending on availability of food. But jays are also known to migrate in huge flocks around the Great Lakes and on the Atlantic coast. The reasons for this great movement is a mystery. 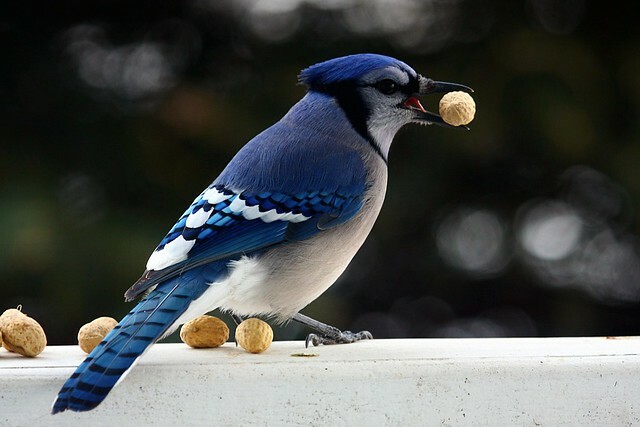 Blue Jays are skilled mimics. They are able to impersonate the calls of other birds, including raptors. A Blue Jay may mimic the call of a Red-tailed Hawk or a Red-shouldered Hawk in order to frighten other birds off of feeders so the jay can eat in peace. Calling out as a raptor may also serve to determine if any actual predatory birds are in the area. Blue Jays are known to mob potential predators. A Blue Jay or a group of jays that finds a predator, like a bird of prey or a snake, will call out a warning to other birds. They will also chase or dive-bomb predators to get them to leave the area. Blue Jays can raise or lower their crests. A crest at rest means the bird is relaxed. A raised crest indicates agression or excitement. Adult male and female Blue Jays look alike. They have the same coloration all year. Blue Jays mate for life. The longevity record for a Blue Jay living in captivity is over 26 years. The record for wild Blue Jays is over 17 years. This is known via bird banding programs. Blue Jays are particularly susceptible to West Nile virus. 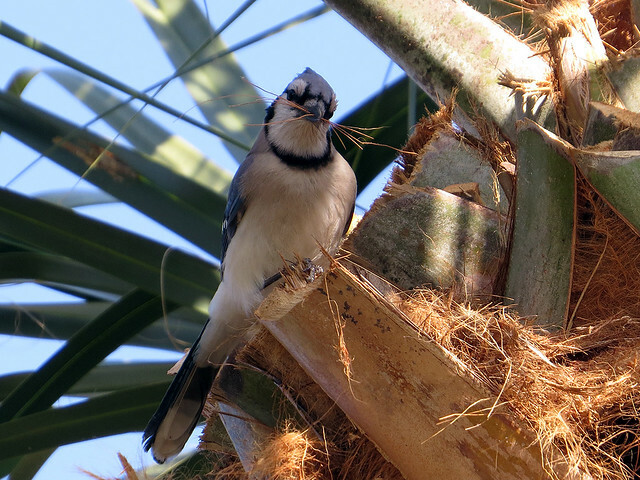 The disease can deccimate populations locally, but recent outbreaks have not significantly affected the global Blue Jay population. 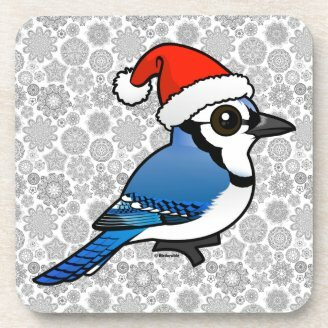 The Blue Jay is the official bird of the Canadian province of Prince Edward Island. 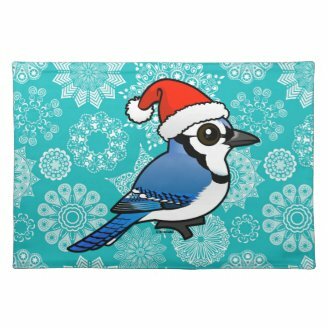 Blue Jay Santa Placemat 20" x 14"
Blue Jay Santa Fleece Blanket, 30"x40"
9 comments on "Fun Facts About Blue Jays"
we have grey jays and blue jays.oh and some times the western scrub jays. Very interesting facts... 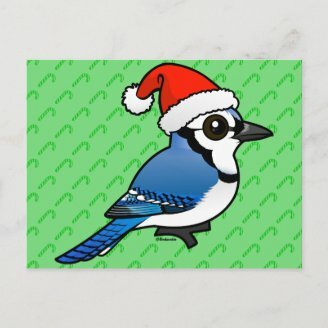 I love Blue Jays! MY BLUE JAY WAKES ME EVERY MORNING. I THROW HIM OUT PEANUTS. 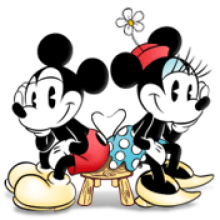 IF I WAKE FIRST, I WHISTLE AND HE COMES. We have scrub jays and stellar jays. We live on a hillside and I line up peanuts on the railing of our deck. The birds hide peanuts in the ground, and then the chipmunks come out and move them. The scrub jays seem in intimidate the stellar jays. It's my favorite weekend entertainment. I make a clucking sound when I go out on the deck and the are already waiting.